The freelancer has announced to work with Bank Asia and MasterCard Payoneer to bring the country's fast earned money through an independent card. The announcement was made at a ceremony held at the city's capital Dhaka on Thursday. The freelancer is an online platform founded by Payoneer as the medium of transaction. Freelancers of Bangladesh can take freelancing income from various online marketplaces through payoneer. In the beginning of this year, independent cards launched in collaboration with Bank Asia, MasterCard and BASIS will now be linked to Payonia's account. In this, freelancers can transfer money to their money even in dollars. In this case, Freelancers will need an independent MasterCard, Smartphone Bank Asia Smart App and Payoneer Account. Bank Asia President A Arfan Ali said that the facility of adding Payonia to independent card organizes a milestone for the freelance community and ICT exporters of Bangladesh. Through this freelancer and ICT exporters can use local and foreign currency as per their requirement. 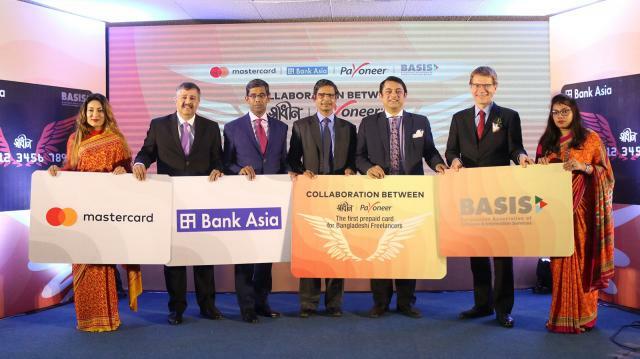 Patio De Corci, Asia's chief executive of Pioneer's Asia Pacific, said that Payonia is working with Bank Asia and MasterCard to bring the best payment solution for freelancers in Bangladesh. Syed Mohammad Kamal, Country Manager, MasterCard Bangladesh, said, "This is an excellent initiative of MasterCard and Bank Asia, which is timely in the socio-economic context of our country. It will benefit the freelancers to bring money in the country.